#1 How to Use a Gun Cleaning Kit Like a Pro? #1.1 Why You Need to Clean Your Gun? #1.2 Why a Gun Cleaning Kit is Helpful? #1.5 How to Use Your Gun Cleaning Kit? If you’re a gun owner, it’s extremely important to understand the basics of cleaning your gun. 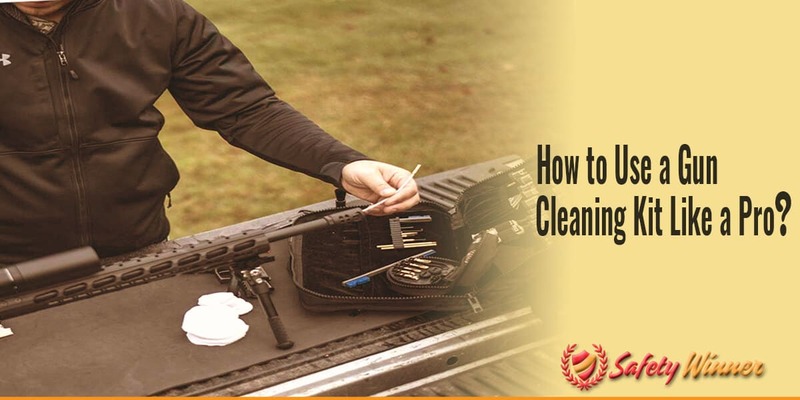 Even though it might seem like a simply process, cleaning a gun actually takes a decent amount of skills and knowledge, as well as a comprehensive list of materials that can usually be found in a gun cleaning kit. That being said, here is a quick guide on how you can use a gun cleaning kit to clean your gun like a pro! Why You Need to Clean Your Gun? Did you know that your gun gets dirtier every single time it’s fired? Yes, that’s right. Every single time that a bullet is fired from your gun, a variety of dust and minerals are left behind. This creates a slow accumulation of minerals, which could ultimately deter your gun from shooting. It could even ultimately cause your gun to completely breakdown. That being said, it’s important to regularly clean your gun. While it would be wonderful if you cleaned your gun after each use, that’s just practical. So, make it a habit to clean your gun after every few uses, or at least once every few months. Why a Gun Cleaning Kit is Helpful? By now you should understand that cleaning your gun is extremely important. But, without the necessary materials, you won’t be able to adequately clean your gun. That being said, you should consider purchasing a gun cleaning kit. A gun cleaning kit is a great option for gun owners because it offers the convenience of having all of the materials in one place. With a gun cleaning kit, you will have peace of mind knowing that you have all of the necessary materials you need in order to adequately clean your gun. In other words, you won’t have to worry about spending a bunch of money or running around town just to find all the items you need. There are ultimately two kinds of gun cleaning kits: the universal cleaning kit and the gun specified cleaning kit. Each gun cleaning kit is pretty self-explanatory. For example, universal cleaning kits are applicable for any type of firearm. It should be noted that although you can use a universal cleaning kit to clean any type of firearm, this type of gun cleaning kit doesn’t include any special equipment. That being said, this is the perfect gun cleaning option for people who have multiple types of guns and just wants to focus on ensuring each gun is relatively clean. As for the gun specified cleaning kit, it is designed to only be used for certain types of gun. In other words, a gun specified cleaning kit will include special materials you need to adequately clean a specific type of gun. For example, your gun specified cleaning kit might include extras like a long rope or even a flashlight. Cleaning Liquids. Let’s face it: you won’t be able to adequately clean your gun unless you have the right cleaning liquids, and standard soap and water just isn’t going to cut it. That being said, your gun cleaning kit should include a variety of cleaning liquids from standard solvent, to degreaser and even lubricant. Cotton Patches. Cotton patches are argumentatively the most important essential for cleaning your gun. This is because the cotton patch is ultimately the item that is going to ensure the cleaning liquids come into direct contact with your gun. It should be noted that most gun cleaning kits come with an influx of cotton patches. This is because you should use a new cotton patch every thirty seconds, or whenever you notice the cotton patch is extremely dirty. That being said, expect to use at least two or three cotton patches every time you clean your gun. Rod Attachments. Of course it’s important to have a durable and reliable cleaning rod, but without any attachments, you won’t be able to adequately clean your gun. Attachments are ultimately what connect your cleaning rod to your gun. With attachments, you will be able to easily and efficiently attach the cotton patches to your cleaning rod. Therefore, you can easily push the rod and back forth throughout your gun to make sure it is adequately cleaned. Brushes. Even though the cleaning rod and cotton patches will do most of the cleaning, it’s important to have at least one standard bronze brush. A bronze brush is important because it will help you fine tune the condition of the gun, as well as make sure there aren’t any minerals or leftover powder inside the barrel. It should be noted that it’s also important to make sure the brushes included in your gun cleaning kit are bronze. This is because bronze is an extremely durable metal that will withstand virtually any type of mineral or condition. While bronze is durable, it’s also soft in the sense that you won’t have to worry about it causing any internal scratches. How to Use Your Gun Cleaning Kit? Once you purchase your gun cleaning kit, put it to use. Start by setting up your gun cleaning kit in your workspace. Prior to pulling the gun out to begin the cleaning process, make sure that the room is decently ventilated and there is enough space to spread out your materials. After all, you should be able to access any of the items at an arm’s length. Dissemble Your Gun. Once you have cultivated the perfect workspace, pull your gun out and dissemble it. This process will ultimately be different for each type of gun. So, make sure you have access to your owner’s manual. This will act as the perfect reference guide, so you know how to properly dissemble and eventually reassemble your gun. Start with the Barrel. Once your gun is dissembled, get to cleaning it! The barrel is ultimately the priority portion of your gun, which means you should focus on cleaning it first. Simply take a bronze brush and push it back in forth to clean the barrel of any grime or other minerals and materials that have accumulated inside your gun. Afterwards, take the cleaning rod and attach a cotton patch to the tip. Then, dip it into some solvent, and repeat the same process you did with the bronze brush to make sure your gun is adequately cleaned. Finish with Lubrication. After cleaning the internal portion of your gun, take a small amount of lubrication and pour it into the barrel. This will help ensure that future bullets easily slide out of your gun. The lubrication will also serve as a sealant. In other words, it will protect your gun from scratches and other damages from built up dirt and other minerals.